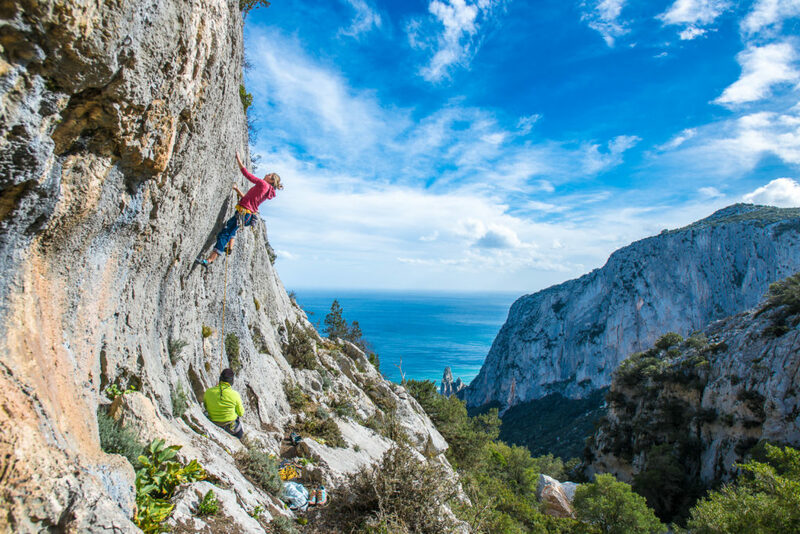 Climbing in Sardinia is simply fantastic and Sardinia’s sunny limestone cliffs are world-famous. 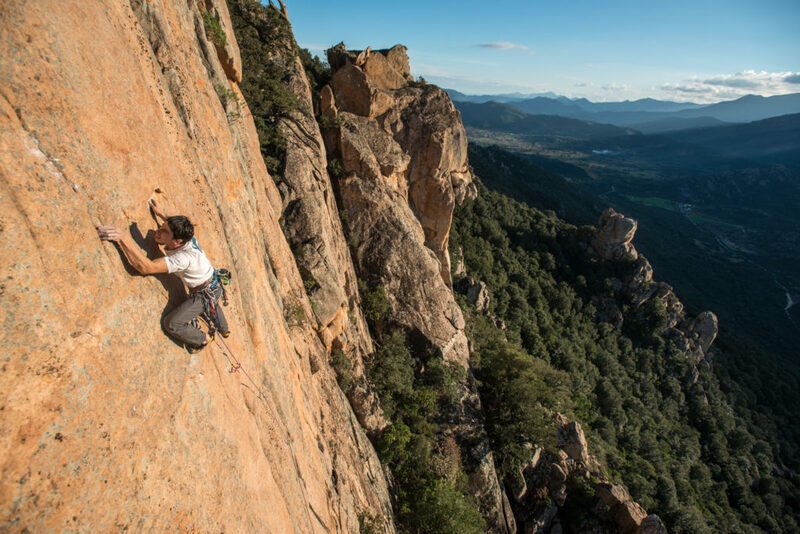 Sardinia is bigger than Wales and has higher mountains, and you can choose from 4000 sport climbing routes in five main climbing areas: Sassari, Dorgali/Nuoro/Cala Gonone, SW-Iglesiente, Isili and “our” Ogliastra. With such a wide choice it’s often not easy to find the best crags and routes for your climbing holiday. Our aim in The Lemon House is to help our climbing guests enjoy their holiday on Sardina to the full, giving the right tip, and even bolting the perfect pitch! Our support ranges from the choice of crags and routes according to ability and preferred climbing style and grade through to encouragement, support and tips. We often help people by putting in the clips and giving hints, so that they climb a route that maybe by themselves they wouldn’t have tried, and taking photos and videos. In Ogliastra there are few local climbers and Riky are often happy to go climbing with guests and celebrate successful redpoints with a beer. So, how should you choose between Sardinia’s climbing areas? And why did we choose to live in Ogliastra rather than one of the other areas of the island? The conclusion is clear: in “our” Ogliastra you can climb all year round, and there are not only 950 single pitch sport climbing but also 130 multi pitch routes as well as bouldering and DWS within an hour’s drive of The Lemon House. Ogliastra has seen lots of development in the last few years. “This area is starting to seriously threaten Cala Gonone as the principle area of Sardinia for visiting climbers. 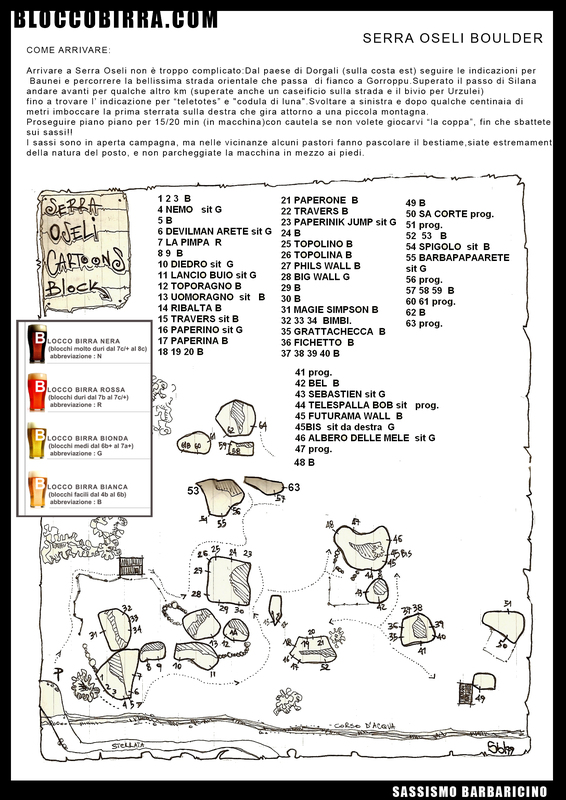 Not least because Baunei is very near to the crags of Urzulei and no more than half an hour by car from those of Jerzu/Ulassai, which means a huge choice in the space of a few km…” states the 2011 Pietra di Luna guide. And since 2011 the development has continued! But this area remains the least discovered of Sardinia’s climbing areas, with marvellous unpolished rock and no queueing. Top climbers James Pearson and Caroline Ciavaldini came to the same conclusion, when interviewed them at the end of 2012 for Versante Sud’s yearbook UP. James said: “Sardinia – amazing place, and so much potential! It’s rare to find somewhere so unspoilt and so little developed.” James was talking about the east coast and Ogliastra which you see in the HYKNUSA trailer in the centre. Cala Gonone is 90 minutes drive from our house but it is sometimes busy, a bit polished and hot in summer; Domusnovas and Isili are other important climbing areas but they’re not by the sea. But here in Ogliastra you often you have the crag to yourselves and by choosing the right altitude and crag orientation you can climb all year round like we do, and go for a swim or sunbathe afterwards! In particular, Ogliastra is Sardinia’s best area for climbing in summer, with high (800-1000 m amsl) mountain crags near the coast which enjoy cool afternoon shade even when it is very hot by the sea. Peter and his Sard friends climb hard routes in August, as the video on the right makes clear. Climbers are often surprised, when the discover how many other activities they can do on rest days in Ogliastra. Or perhaps not all the group members want to only climb ;). They can also walk, mountain bike, kayak or road cycle. The Guardian listed The Lemon House as one of Europe’s Top 10 activity holidays in August 2012 due to the wide range of outdoor activities here. Baunei crags—only 10 minutes from our accommodation! 400 single pitch sport climbs on fantastic limestone, with 30 4’s and 5’s through to French 8b+/c overhanging testpieces at Monte Scoine, Sistema Solare, Cengia Giradili, Monte Oro, Villaggio Gallico, Creuza de Ma , Campo dei Miracoli, Braccio di Ferro, The Lemon House, Su Telargiu Oro, Dinopark and Santa Maria Navarrese, a small crag right by the port with lots of easier climbs. We even have a granite crag; Lucertole al Sole, with 20 routes only 10’ walk from the house! Urzulei – Serra Oseli e Genna Croce, due crags ideal for spring, summer and autumn at 800-1000 m altitude, 45’ drive away, near to Urzulei. Walls and steep routes from grade 6 to 8a/+. Jerzu & Ulassai Two crags (Castello and Isola del Tesoro) facing west and one (Palazzo d’Inverno) facing east at 750 m altitude, with over 230 single-pitch sport routes mostly from 6a upwards with steep, fingery and technical climbing on superb rock at Jerzu. 45 minutes’ drive from our accommodation . At Ulassai (220 routes in total) the Cascate di Lecorci has similar standard climbs, with the very popular ‘Canyon’ (gorge) offering quite a few easy routes (French 5b and c) through to several 8a/8a+’s. There is a new steep sector, the Cave of Dream, facing NW and the most recent Sector, Marosini, offers overhanging crimpy walls, mostly grade 7. Quirra A sun-trap in winter overlooking the river valley, an hour or so from the house. From 4c to 8c, slabs to OHs. Too hot in summer but with full sun and out of the wind, a great location in winter. 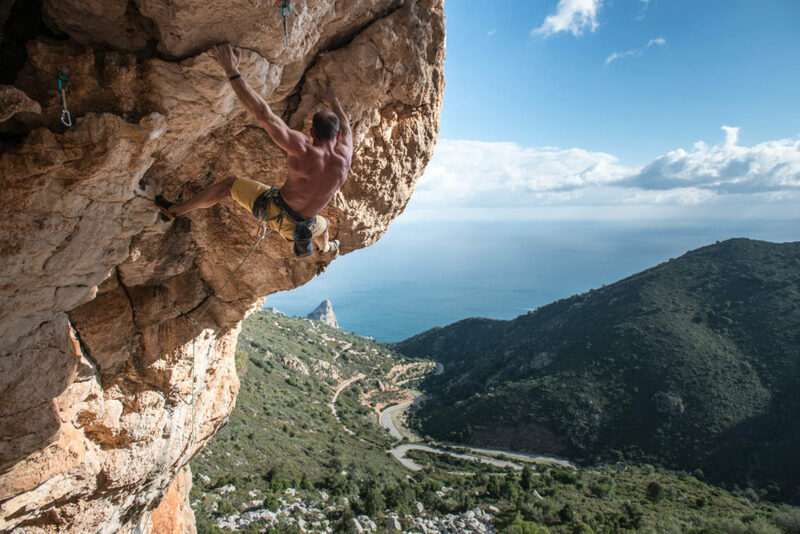 Most people come to climb single-pitch sports climbs in Sardinia. But the multipitch routes are another world, frequently taking you into beautiful and remote settings. 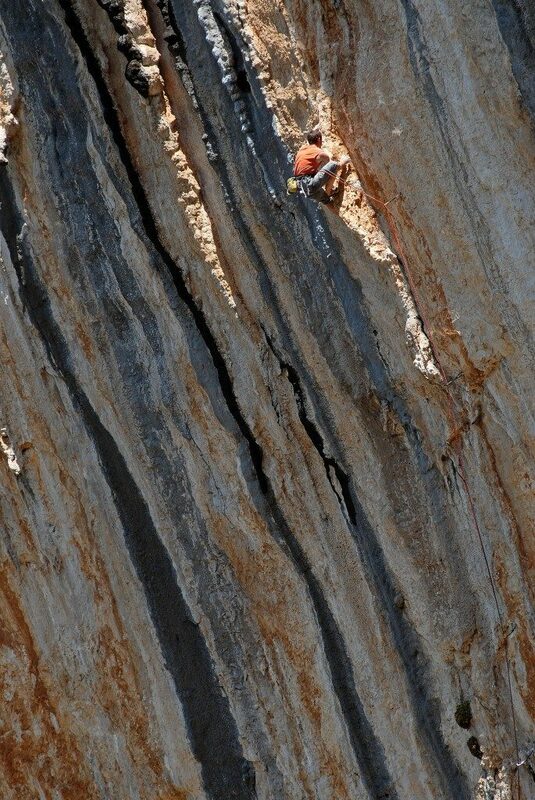 See this UKC article written by Peter Herold on multi-pitch sport climbing in Sardinia. Many people say one of the many differences between Sardinia and Kalymnos are the multi-pitch climbs here. With the walk in and out, and the “Alpine” rock climbing and abseil descents, these are long, satisfying days out you won’t easily forget. Near Baunei, there are long (6+ pitches, 140-400m) harder (a few 5c obligatory, most 6b obl or higher) routes on the Aguglia pinnacle at Cala Goloritzè, Punta Argennas, Punta Giradili and Monte Ginnirco. 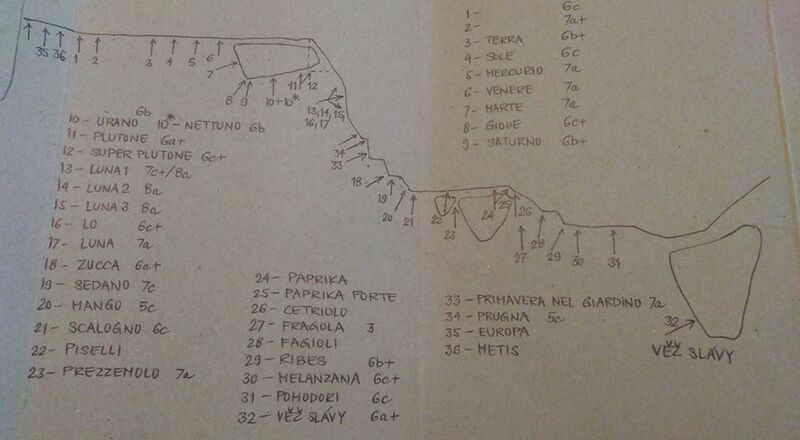 The most popular route on the Aguglia is Easy Gymnopedie F6b, F5c obl, see photo on the right, while the easier Marinaio di Foresta on Pedra Longa F6a+ (F5c obl.) with its spectacular climbing over the sea is rapidly becoming one of the area’s most popular routes. Near The Lemon House in Lotzorai there are many granite boulders which Peter Harold explored in 2008, producing a little guide for our guests’ use. There are also some good boulders just near our apartment in Porto Frailis. The best bouldering, though, is 45 minutes’ drive away, on the superb limestone boulders at Serra Oseli. You can download the guide from the bloccobirra site and the update with lots of problems we’ve climbed here. Thanking the Ragni di Lecco (I’m a member!)) and thanking the allmighty Passini, Cristian, Francesco e Roberto we started the bolting project of an amazing big crag: Cengia Giradili. We bolted 17 routes, from 5a to 8boh? with the easy pitches on crazy lunar grey limestone. Not to talk about the landscape. Here you see Elena working on her 6c project at “le Terrazze” sector. Jan is not only enthusiast: he goes beyond. This winter he and his crazy crew bolted 40 new routes in a new crag over villaggio gallico. All year long climbable, there is plenty of great routes on any difficulty. We have developed several new sectors, with bolts bought from The Lemon House’s bolt fund to which our guests contribute. Our first new routes date from 2007 when we began developing the crag called “The Lemon House” with guru of Sardinia climbing Maurizio Oviglia. Some friends then joined Peter Herold to bolt some easier routes (grade 4-6a) near to The Lemon House. Ogliastra lacked a shady, high-up cave for hard, steep summer climbing, and in the period 2008-2011 we fixed this, developing the Su Telargiu Oro cave, which has 38 routes, 33 from 6a to 8b+/c and a couple still to be freed. In the winter of 2011, we helped our Czech friends add 18 routes to Monte Oro. Then in September 2012 we continued development of the new “Dinopark” sector on the east coast of Sardinia only 30 minutes door-to-door from the The Lemon House: 15 minutes by car to Pedra Longa then 15 minutes’ walk. If you want to climb steeply overhanging tufas 7a – 7c+ this is the place for you! Check out Tomas and Jan in the great video above! Topos here. Ideal in autumn, winter, spring. In winter 2012 it was the turn of Planu ‘e Murta near Cala Sisine, while by summer 2015 Monte Oro boasted 70 routes, including in particular 12 routes up to 6a which remain in the shade in the mornings – on the east coast most routes only go into the shade in the afternoon. Another good summer crag, near to Su Telargiu Oro and with similar climbing, is Tenòsili (summer 2016). As important as new routes, we also maintain existing routes, and from summer 2012 are upgrading routes by the sea with bolting using more corrosion-resistant steel, see the photo right and our blog posts on this important issue 1 and 2. You can find glue-in bolts which you can turn a little, due to the glue depolymerising. You find this particular with the lower bolt at a French stance, since it’s subjected to torsion during top-roping. In the photo on the left, one such lower-off has been repaired :). You can find information about other new routes on Sardinia in Maurizio Oviglia’s reports on planetmountain.com. Take note! 27 March 2014 In the winter at Campo dei Miracoli (Pietra di Luna p.366) there was a repeat rockfall after the one in 1997. The routes 6.Timmi – 12.Campo dei Miracoli are affected, climb at your own risk!